Remember the Legend of Zelda: Symphony of the Goddesses? Well now it’s Pokemon’s turn! According to the official Pokemon site, Pokémon: Symphonic Evolutions is a new concert orchestra going on tour NEXT MONTH. 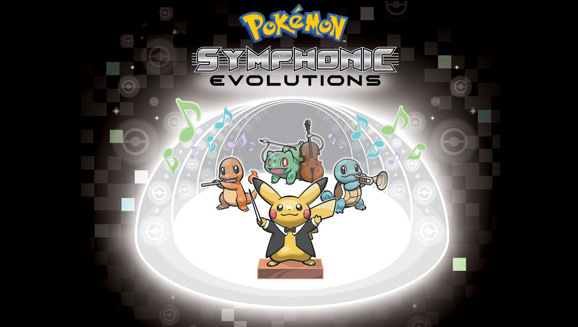 Symphonic Evolutions will feature musical arrangements from all the Pokémon games! Unfortunately this is a US only thing as of now. Hit the jump for initial tour dates! Get the Unova Pokedex for iOS FREE! For a limited time, the Unova Pokedex for iOS is available to download free of charge. All you need to do is visit the App store and download the full Unova PokeDex for free! (Usually priced at $1.99/ ￡1.49) You will need to spend some money to to unlock the other regions, but their price has been reduced to $3.99 each (previously $5.99/ £3.99), meaning you can turn your iPhone into a full national Pokedex for just $15.96. With the end of the Pokemon E3 Developer Round Table, the information keeps on coming. Another XY trailer has been released, and this one features even more new Pokemon, along with some gameplay of the newly revealed game mechanics in action. The official Pokemon Website has also been updated with more detailed descriptions on what has already been revealed tonight. Screenshots, official art, and more after the jump! Just a quick note: today we are expecting some big news, specifically a Pokemon reveal. It will most likely be revealed during Pokemon Smash, so keep an eye out later today for a link to the Smash stream as well as our live blog commentary. A new batch of Pokemon episodes have been added to Pokemon TV, here is the list of episodes available until April 11th. Unova Battle Week on Pokemon TV has just been announced. Every day this week four Unova-era episodes will be posted featuring a battle. Today the following episodes are featured: The Battle Club and Tepig’s Choice, A Rival Battle for Club Champ, Club Battle Finale: A Hero’s Outcome, and Meowth’s Scrafty Tactics! You can find all these episodes and more on Pokemon.com, or if you have an iphone or ipad you can also watch them on the Pokemon TV App. So you wanna be a master of Pokemon? But do you lack the skills to be number one? Fear not, the Official Pokemon Twitter and Facebook account have just announced that there will be a Pokemon Mastery Degree program available at participating Colleges across the country this Fall. So forget all those dreams about becoming a Doctor or a Lawyer, and live your TRUE dream of becoming a Pokemon Master. They have already revealed a teaser of the course schedule above. Take exciting classes such as Pokemon Abilities and Development and Human and Pokemon Dynamics; all of them will help you become a true master of Pokemon, to understand the secrets and have some fun! For a list particapating Universities, as well as more info on the courses shown above click here. Watch Meloetta’s Moonlight Serenade & Kyurem vs The Sword of Justice on Pokemon TV for a Limited Time! Meloetta’s Moonlight Serenade, a special never-before released short, along with the full length Pokemon Movie Kyurem vs The Sword of Justice are now available to watch with the free Pokemon TV App! If you don’t have a smart phone or tablet, you can watch them on Pokemon TV on the official Pokemon website. Kyurem vs The Sword of Justice is only available until the 18th of February, it will be gone in a matter of days so don’t miss the chance to watch it while you can. You’ll have more time to check out Meloetta’s Moonlight Serenade though, which will be available on Pokemon TV until March 24th.